We managed to get back to playing Soul Shaker again this week. And while we have not played, Soul Shaker has continued to rise through the charts and was last seen holding at a healthy position of 6th place. Furthermore, this is also the week that AME will be announcing their Debut Author for the 2007 Golden Dragon awards for which I have been nominated alongside a couple of others. As I said previously, even to be nominated is an honour, and I can only hope for anything more against such excellent competition. This week I released SSPatchedScripts v1.08 to allow the Spiritualise spell to give the correct number of spirit fragments when used against damaged items. I had done this for the Spirit Disruptor last time, but neglected to alter this script as well. It is not a major fix, but one that I feel needed to be done. At one point during play, I did think my Realm Soul Sword was not working as it was meant to. i.e. I thought that using its abilities was supposed to drain a charge like the magik versions, but realised after checking the code that Realm Weapons are only supposed to lose integrity if a miss-hit is made. In other words, it is supposed to be one of their major advantages over the other weapon types by not losing integrity so often. Anyway, I was glad that I did not have to do anything there after all. "Stepping onto the balcony, the heroes were sheltered from the rain by the walls of the citadel. 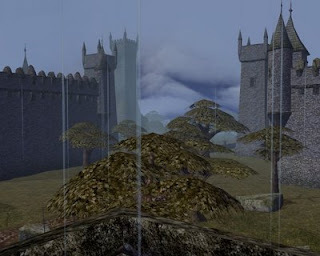 Through the pouring rain ahead of them they could see an ominous looking tower beyond the reaches of the citadel itself. Was this the lich's tower? Was Terrell being held captive here? The heroes current search of the citadel had proved futile up to now, and unless Terrell was being held somewhere on the top floor, then they would have to extend their search to the outer areas, and very likely the tower as well. Whatever the situation, the tower was not a welcoming sight and somehow appeared out of place here." Read the full synopsis here.